Sinfin is a suburb and ward of the city of Derby, in Derbyshire, England. It is situated approximately 3 miles (4.8 km) south-southwest of the city centre on Derby's southern outskirts. The ward, which includes Osmaston as well as Sinfin itself, had a population of 15,128 in 2011. Historically, Sinfin and Osmaston were separate villages before being swallowed up by the expansion of Derby. Osmaston is characterised by inter-war housing developments while much of the housing in Sinfin is postwar. Between the two suburbs lies a more industrialised area dominated by the Rolls-Royce works. Sinfin is recorded in the Domesday Book produced in 1086 as Sedenfeld as a manor that belonged to baron Henry de Ferrers. Mention is made of two carucates of land assessed to the geld; land for one plough and two villeins having another and of 6 acres (2.4 ha) of meadow. The land was valued at ten shillings. Its undertenant was named William, later William de Rolleston, a vassal to Henry de Ferrers, who displaced a Saxon thegn named Ulfkell. Today the Ferrers name is still seen in Sinfin. Sinfin now has two distinct areas – the "new" and the "old"; it also merges with the Stenson Fields district of South Derbyshire to the south. 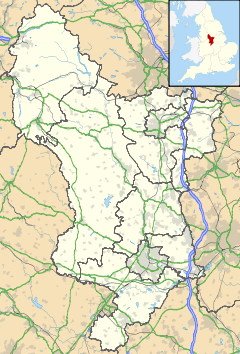 The "old" part is bordered to the north by the Derby – Crewe railway. Here, at the outset of WW2, was built a substantial ordnance depot. This was protected by a series of pillboxes, gun emplacements and barrage balloons. Most of this is now built over but some evidence remains. It once had a railway passenger station Sinfin Central railway station at which passenger trains last called in May 1993. Sinfin is one of the seventeen electoral wards which make up Derby, and as such elects three councillors to Derby City Council. As of the 2015 local elections, all three councillors for the area represent the Labour Party. It is one of seven Derby wards that form the Derby South constituency in the House of Commons of the United Kingdom Parliament. According to the 2011 Census, Sinfin ward had a population of 15,128. This was a 9.77% increase on the 2001 Census figure of 13,782. Sinfin also has a shopping centre. This houses a travel agent, a library, an Asda supermarket and a newsagent, chemist, amongst other outlets. The 24 hectare (60 acres) Sinfin Moor Local Nature Reserve lies on the southern edge of the community. Secondary schools serving the Sinfin area include City of Derby Academy. Primary schools serving the Sinfin area include Redwood Primary School. Sinfin Moor Church was built in 1970 and is a Local Ecumenical Partnership. This means that people from three denominations worship there: Methodists, Anglicans and United Reformed Church. There is also a Roman Catholic church, a church centre and, at the older part of Sinfin, St Stephen's Church. Ted Moult – TV Personality in 1950s and 60s. Goodsmoor Bridge overlooking the Ordnance depot, circa 1964. ^ "Ordnance Survey Election Maps website". Ordnance Survey. ^ The Victoria History of the County of Derby, William Page, Ed., volume one, 1905, Archibald Constable and Co. Ltd.
^ "Councillors". Derby City Council. Retrieved 11 December 2015. ^ "Sinfin Profile 2011/12" (PDF). Derby City Council. Retrieved 11 December 2015. ^ "Local Nature Reserves". Natural England. Retrieved 3 February 2011. Wikimedia Commons has media related to Sinfin. This page was last edited on 2 January 2019, at 16:12 (UTC).